If you ask me what my favourite restaurant in the country is I will not hesitate to say L’Enclume in Cartmel. We first went in 2010 and tend to revisit it every year or so, usually in different seasons. Last week was our fifth time and even though in the interim the baton has been handed to a new head chef there’s still that seemingly effortless perfection to the cuisine. At its core are the ingredients, all taken from the lush Cumbrian land and coast. Every bite is a reflection of the season and locale, the essence of every ingredient amplified using cutting edge techniques but naturalistically presented with simple grace on the plate. There’s a sense of whimsy in the way the food is almost too beautiful to eat, but when you get over this the flavours actually hit you between the eyes. I remember the smoked eel and ham fat croquettes from last time and again these are a standout. Such a hit of flavour and textures, the crispiness coming from a coating of puffed pork skin encasing a delicately dissolving filling. The tartare dish with coal oil. This time shorthorn beef, I ask for extra bonbons because for me that’s the genius of the dish. Sweet gin-filled bonbons that burst and elevates the dish to something other than smoke flavoured raw meat and garnish. Lobster two ways. Raw claw, covered in shaved parsnips. Cooked tail, smothered in lobster sabayon with watercress and nutty fudgey black pudding. Turbot with a shallot puree so rich and smooth you’d want to spread it onto your toast every morning. Crispy chicken skin coats the top of the juicy flakey fish. The intense poultry sauce is balanced by beautifully fresh tasting lovage gel. Every mouthful had me murmuring with satisfaction. Autumn going into winter is not a good time for fruity desserts. Especially here with the locavore ethos. This quince tart pre-dessert saved the day, simply perfect. It’s not only the food, what really makes us return is the wonderful service. 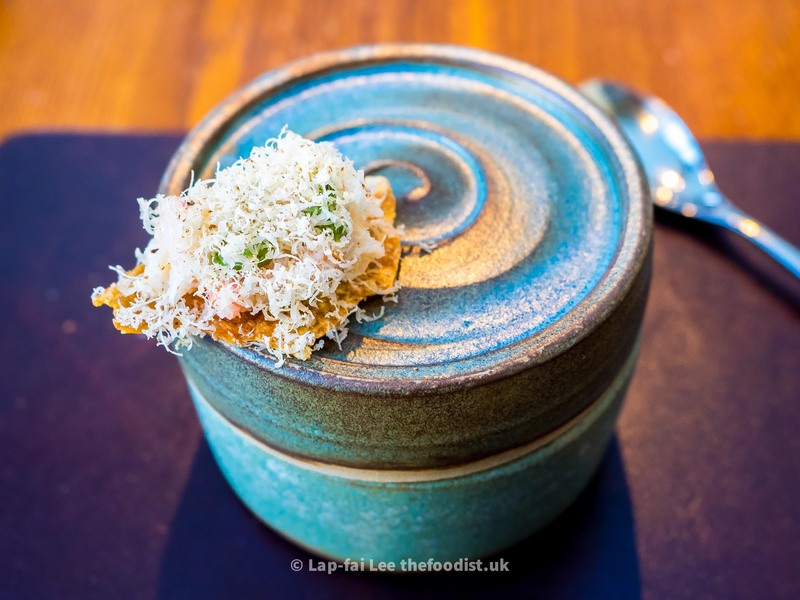 Friendly, informal and unlike the preconception you would have of a 2 star Michelin restaurant. Again it’s a reflection of its surroundings. Laid back like Cumbrian sheep peacefully chewing the cud. At no point do you feel rushed, there’s no angst just calmness and warmth. People say it’s a long way to go for a meal but for me it’s never been an issue. A clear 2.5hr morning run up the M6 from Brum will have you experiencing L’enclume’s magic for lunch and back by 6pm. The very ideal of a “destination restaurant”. Pingback: My favourite restaurants of 2015 | The Foodist. Pingback: Eating out in 2016 | The Foodist.